Time is money and in this case, very big money, as Christie's brought the hammer down on the most expensive Rolex wristwatch ever sold at auction. The rare 1949 Oyster Perpetual model with a cloisonné enamel dial, was expected to sell for between $570,000 and $1.13 million. But strong bidding on Monday pushed the final sale price to $1,220,632. The Christie's watch sale in Geneva, Switzerland, totaled $26.5 million, with 91 percent of the 435 watches selling. The sale shows that the market for high-end collectible watches remains strong despite volatile stock markets and global uncertainty. As investments, collectible watches have grown in recent years, but they lag behind cars, stamps and coins. The market for collectible watches grew 4 percent over the past year and 32 percent over the past five years, according to Knight Frank, the luxury real estate and research firm. The Christie's sale, which lasted eight hours, showed that today's collectors are truly global. The auction house said the sale had bidders from 30 countries. The top lot was a Patek Philippe. The platinum cushion-shaped minute repeating wristwatch was made in the early 1900s for prominent banker Henry Graves Jr. He was an avid watch collector and one of his watches—called the Supercomplication—sold for a record $11 million at Sotheby's in 1999. The Patek auctioned off Monday went for $1,340,804, which was at the low end of the estimate. But the Rolex was the big upside surprise of the sale. 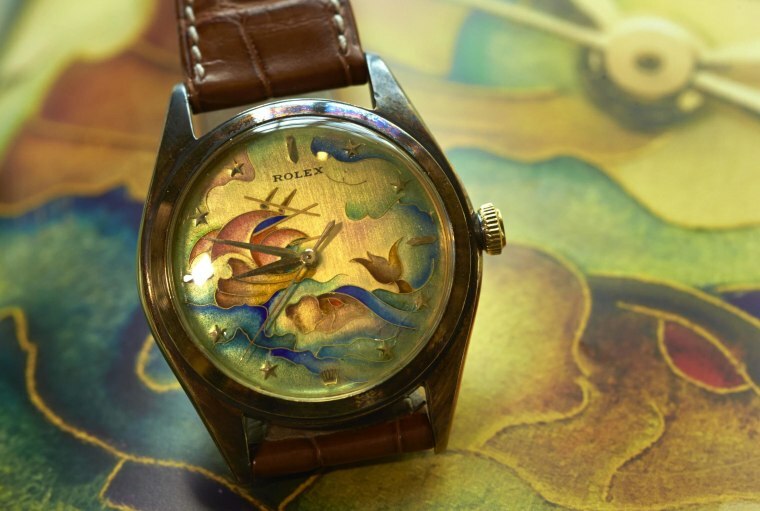 The piece is an 18-karat gold automatic with sweep center seconds, automatic jeweled lever movement, star numerals and the enamel dial, which depicts a whale and frigate sailing through stormy seas.